F1RST Friday. Something fun for everyone. Every year thousands of people come downtown to enjoy live music, shopping, dining, contests, and free activities. Each month we have themed events to make each event special. Thank you to our 2019 Sponsors! F1RST Friday celebrates in the warm indoors, shop local in downtown shops and restaurants. Date night downtown Statesboro. 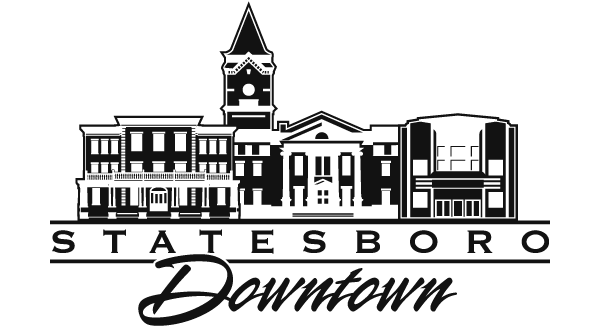 Walk downtown Statesboro an enjoy an evening of shopping, dining and entertainment. Our March F1RST Friday is a doggy lovers event. Dress up your pup with lots of green (St. Patrick’s theme) and you could win treats and prizes in our dog contest. This year we will be at our new Downtown Dog Park on East Cherry St.
Our April F1RST Friday event will celebrate a Relay for Life of Bulloch County in the heart of our downtown. There will be a survivor and caregiver walk , live music, vendors and a luminary ceremony. In June our F1RST Friday focuses on Statesboro as a vacation destination. Vendors and businesses come out and celebrate all the great things about summer in Statesboro such as sunshine, time at the pool, time to spend with your friends and family, and local activities to keep everyone of all ages entertained. In August our F1RST Friday brings together all of the spirited high schools in the Bulloch County area to have to have one huge pep rally to get the community and students excited for all the fun that the new school year brings. The football players, cheerleaders and bands share their energy and spirit for their school with the Statesboro community in this entertaining high enthusiasm event. What better way to spend your first Friday of fall by giving your taste buds something it will remember for a long time? The taste of downtown is a F1RST Friday event gives the attendants a chance to sample savory delights from the restaurants located in Downtown Statesboro. Break the chain and enjoy one of the most delectable F1RST Fridays Statesboro has! An evening that celebrates agriculture and agribusiness in Bulloch County. We close off streets and enjoy tractors, food, and more as we gather to celebrate our largest industry in Bulloch County. This year, Georgia Southern wants to turn the tables and show its love for the Statesboro-Bulloch County community with A Day for Statesboro. Join us in downtown Statesboro for First Friday with live music, food, fun Georgia Southern displays and a few surprises! Our December F1RST Friday fills our downtown with Holiday Cheer as the streets are filled with holiday food and arts and crafts vendors while the sounds of seasonal music fill everyone’s ears. Audiences line the streets as the holiday parade with Santa Claus special guest travels through the streets of downtown. In addition to all the festivities, businesses participate in a Chili Town Cook-Off where attendants can taste different chilies and vote for their favorite. F1rst Friday dates subject to change because of inclement weather.